Working on "Nutcracker Suite" by Cranberry Pie Designs. 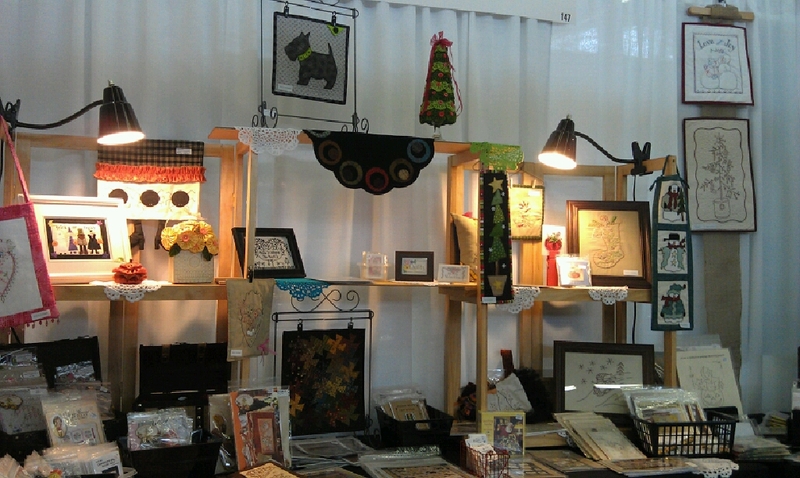 Will be carrying the patterns this year at the Houston International Quilt Festival. New patterns and two fabric lines by Crabapple Hill Studios this year. 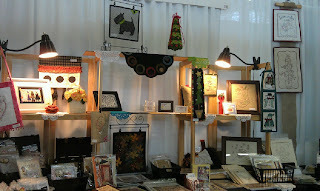 These are pics of our booth at Dallas Quilt Show 2013. Everyone was super nice & we enjoyed being there. We introduced several new patterns and designs. This wall hanging quilt is done with hand embroidery and embellished with hot-fix crystals. embellished with yoyos and pearl beads. This is a pattern for two different bunnies and a chick. All made from yoyos. I have been very busy. My website is now up and running. www.christyandco.us Please let me know if there are any problems with it. I'm slowly adding more inventory. I've been working on demos of patterns that I am stocking. And, I have been designing. I'll post more on the new designs later this year as I plan to present my designs at the Houston International Quilt Show in Houston this fall. Here are some photos of the demos I have done. Ok... I couldn't get the photo to rotate. This is a pattern I received last week by Crabapple Hill called Celinda Wickenblat's Spellbook I traced project and stitched the front in one afternoon. And, finished putting the book together the next day. This was a really fun and quick. The pattern comes with 3 pages of "spells". Of course, I thought I would add a few more pages. These three adoreable stitcheries are by Shirley Hudson at Hudson Holidays. These were also quick, easy and fun. This pillow is a design by Bunny Hill. I made it with wool, flannel, and homespun fabric. This is one part of three stitcheries from a pattern by Bird Brain Designs. This is a pillow I made for my father for Christmas 2011. My father had a brother who passed away at age 21 with lymphoma. His brother had a 1955 Chevy he restored. The fabric border and backing consists of the upholstery fabric his brother bought for the seats. My grandmother found the fabric last summer & gave it to me when my studio was completed. She wasn't sure that I would be able to use it for anything. But when she told me where the fabric came from, I had to do something with it. My oldest son drew the picture of the car for me. And, I traced it on to the fabric, colored the drawing, and stitched the outline. I used Derwent Inktense Pencils (watercolor). I came across these pencils at a quilt show and wanted to try them out. The coloring can be set to become permanent. Don't use too much water. It (the color) will bleed outside of the drawn line. Yes, It is permanent after it has been wet & allowed to completely dry. Other pencils and brands wash out or fade significantly when laundered. And, I need more colors!!! This it a pattern by Meg Hawley from Crabapple Hill Designs. I really do like her work! The center piece is a stitchery that is colored with crayons. I traced the design on to the fabric, then colored it with crayons. Yes, I used regular crayola crayons (64ct box). This was a lot of fun to do. After coloring, I set the colors by using an iron and plain paper. The heat makes the colors permanent. I finished all of the coloring first, then did the stitchery. Now, I need to quilt it. I haven't really decided yet on how I'm going quilt it. 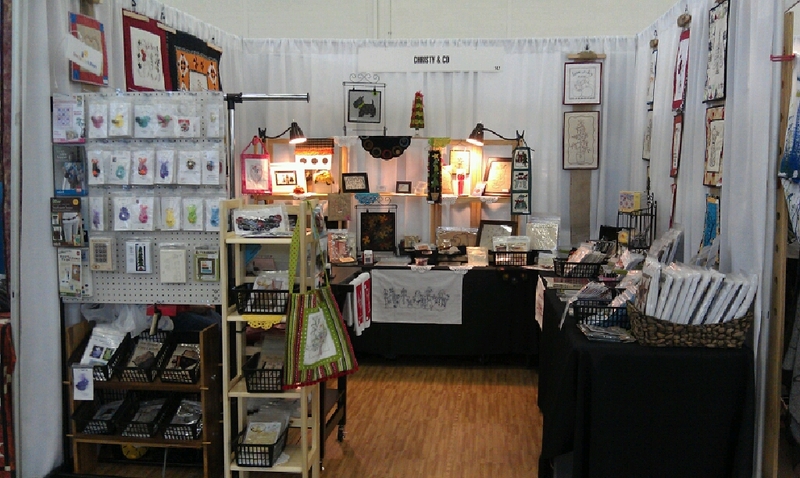 I went back to Quilt Festival after Quilt Market in Houston, TX. Both take place at the George Brown Convention Center in Downton Houston. The place is huge. There is no way to possibly see every thing in one day. I spend a total of five days there and I skipped a few areas. I did take some more pictures. This was one of my favorites. There was so much detail and the minature quilts were darling. This was the line checkout for the Primitive Gatherings Booth. I attempted to go through the booth once. It was really crowded. Front view of quilt. I took a class Show Quilts, From Start to Finish Beutifully-Longarm Demo/Lecture given by the two ladies ( Linda Taylor & Cheri Meineke-Johnson) that made this quilt. The class was on how to make a show quilt. They explained their process. Cheri makes the quilt top and passes it on to Linda. Linda does the Quilting. Then Linda gives the quilt back to Cheri to complete. Cheri does the binding and embellishments. Both gave tips from start to finish on making a quilt. I really did enjoy the class. There was a lot of information given. This is the Penny Rug I finished from another class I took. It was given by Kathy Kansier, Pennies from My Heart. This was a fun class as well. In addition to the project, she discussed topics such as dying wool, fusibles, felting wool, history of wool & rug hooking, and designing your own penny rugs. I thought this one would be appropriate to show today. 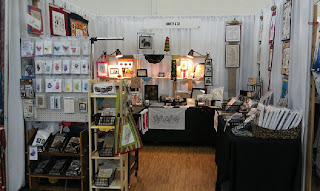 This was my first year to attend quilt market. It is definitely what I expected and more. Not something I stood in line for 2 hours for. More like 5 minutes. I did get to meet alot of people. I wouldn't even try to begin listing them at this time. I, also, viewed the exhibits and took a few photos. I'll try to post a few at a time. I always take alot of pics. Here a few of the photos I took. I tried to get the credits, I apologize in advance if I have overlooked someone. Closeup view. The details on this quilt are amazing! This quilt is all done by hand. Note the tiny rectangle tiles (all appliqued on) and the french knots.